If you’re needing to get rid of a lot of junk from your Gordon home or business, you’ve come to the right place. Whether you’ve got a heap of junk from a home renovation or deceased estate, or whether you’ve just got some large items that are difficult to dispose of yourself, the team at Same-Day Rubbish Removal can take it all away in no time. Our trucks have a huge capacity which makes it easy for us to do these sorts of jobs. There has never been a job too hard for us in over a decade that we’ve been doing this, so you can be almost certain we can help you. We’ve got trucks and teams scattered across Sydney, ready to come to you fast, whenever you need. Don’t let your junk cause problems any longer, give our friendly and experienced team a call today. If you’ve been thinking about hiring a skip bin, we really recommend weighing up the pros and cons of skip bins vs our type of service. The main benefit of a skip bin is that you can have your junk contained on your property for any amount of time. The issues with hiring a skip bin is that they’re ugly and can get in the way, and the benefit of having it for longer comes at a cost. You also have to do all the heavy lifting yourself, which can be difficult if you have a lot of large items. With our service, we collect everything at once, so there are no costs for hiring us longer. We also do all your heavy lifting, you just need to tell us what to take! Our service also cuts the costs of having multiple trips to drop off, pick up, and dispose of your junk, as we do everything in one trip! Instead of everything getting mixed up in a bin and getting sent to landfill, we sort your items as we load so that we can easily drop things off at the appropriate recycling facility – that’s a service hard to beat! Get your Gordon home or property cleaned up today by calling us now. It doesn’t matter whether you’re located in Gordon or anywhere else in Sydney, we’ve got a team ready and waiting for your call. From Caringbah in the Sutherland Shire, Clovelly in the Eastern Suburbs, Petersham in the Inner West, or somewhere in Sydney’s CBD, one of our teams can get to you in no time. It doesn’t matter what type of item you have either, we’ll have no problem in taking it away. From old fridges, freezers, washing machines, or any type of broken down white good, to furniture such as couches, lounges, tables, beds, and mattresses, we’ve seen just about everything. Don’t wait any longer to get your place cleaned up and looking as it should be, call our experienced team now on 0415 957 658 for the fastest and cheapest service on the North Shore. Just south of Gordon, Killara was originally established as a ‘Gentlemen’s Suburb’ which meant there were few businesses in the area. This is still true for many parts of Killara, which has quite a high population for it’s size with few shops. It’s not a long drive on the A1 to get to other suburbs with large shopping centres, etc, which makes it quite a nice little residential area. With so many people living in the area, there’s often a lot of junk to collect from homes at times. Quite often when people relocate there’s a bunch of furniture that they don’t want anymore. It can often be cheaper to buy second hand items than relocate your own interstate. This is a real shame, and unless there’s no chance someone would want it, we recommend trying to give away your items before disposing of them. Call us now to have your Killara property cleaned up. The next suburb south of Killara is Lindfield, another large residential area. 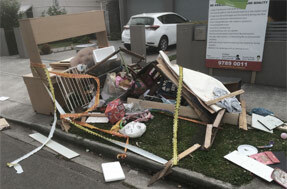 With around 10,000 residents, Lindfield alone produces tonnes of junk every day. Most of this waste is taken away by the curbside bin service, but there are some items like fridges and freezers that aren’t so easy to dispose of. It happens to the best of us, so there’s no point in stressing when your fridge dies or your washing machine breaks down, all you can really do is get rid of your old and replace with a new one fast. Most companies will deliver new appliances free, but don’t offer to take away the old. 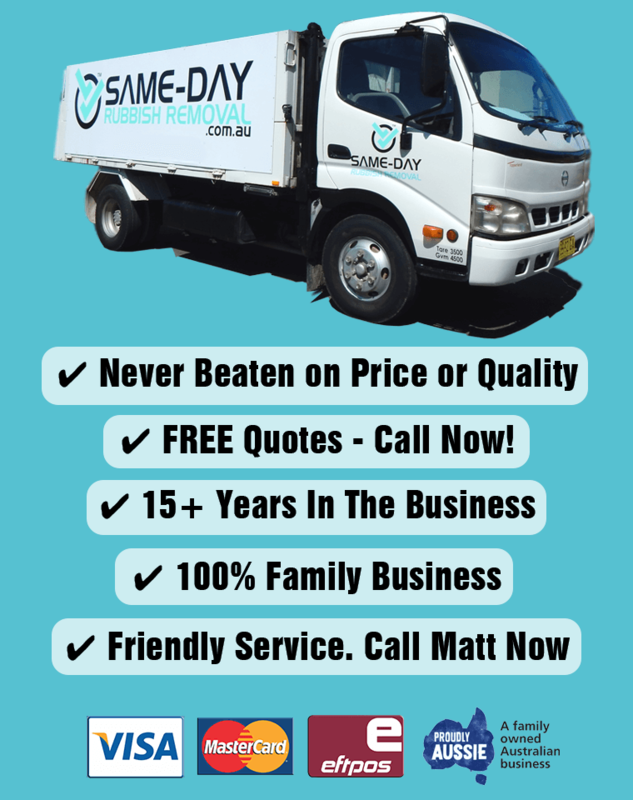 If you’re stuck with an old appliance or any other type of bulky item, give Same-Day Rubbish Removal a call now. The next suburb towards the city after Lindfield is Roseville, and there’s even slightly more people living here! It’s understandable why the Mid North Shore keeps our trucks busy with so many people living here. If your Roseville home or business needs a clean-up, get the fastest and cheapest service by calling Same-Day Rubbish removal now. Customers always love our service and we’ve got many loyal ones who keep getting us back whenever they have junk to remove. Our service makes your life a whole lot easier, as we do all the heavy lifting for you too. 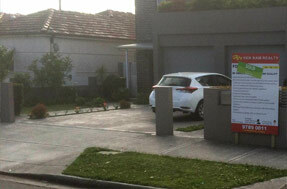 Call 0415 957 658 for a free, no obligation quote.